Every so often a couple more books get added to our already overfull home library, as a result of us going for a little browse in a bookshop. Sometimes I buy a familiar author, other times it’s the look and feel of a book that I like, or it is on sale, or it looks intriguing. And to be honest, sometimes those spur-of the-moment book buys are disasters – a real waste of money. Other times, they are a pleasant surprise, like coming upon a little island gem in the middle of an ocean. The Princess of Nowhere by Prince Lorenzo Borghese, reviewed on this website, was one such. It was amongst the sale books, and it was only the author’s name that got my attention. It turned out to be an unexpectedly enjoyable read. 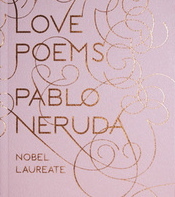 The same can be said of a pretty little publication of Love Poems – Pablo Neruda that was on a table amongst other Valentine’s Day paraphernalia in Chapters. I knew of Neruda, but I am always loath to read poetry, since it requires attention and effort to understand. But this pocket-sized little book, with its pink cover with elegant gold illustrated lettering by Marian Bantjes, said “take me home”. I believe the translations by Donald D. Walsh managed to retain the beauty and rhythm of Neruda’s words, and there wasn’t a single line or stanza that did not touch me. Few poets can express passion, intimacy and longing so clearly, so touchingly. Any person who has ever been in love, will feel his words resonate in them and take them back into those moments of togetherness. I have always wished that I were born with the talent, the words, the way of putting them together, to adequately express love. I keep trying, but Neruda captures so beautifully and tenderly moments of love, that his words speak for me. Those last four lines are just plain gorgeous.